Set the DVR, tear yourself away from the town hall-style debate tonight. 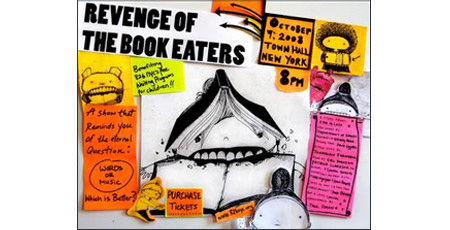 and head to our own Town Hall, 8pm, for the annual benefit Revenge of the Book Eaters. Who benefits? First of all, you do. The lineup includes laughs courtesy of John Oliver, a musical appearance by Paul Simon, a new play by Jonathan Franzen read by Patrica Clarkson, Parker Posey, Bobby Cannavale, and Tunde Adebimpe (lead singer of TV on the Radio). New songs by Department of Eagles (who are members of Grizzly Bear). A story from Ira Glass. And a charm offensive by Dave Eggers, whose nonprofit writing lab for kids, 826NYC, also benefits. As of this morning, there were still a few tickets ($100) left. Real, good, affordable contemporary art. Kathryn Markel Fine Arts, located in the heart of Chelsea's art district at 529 West 20th St., specializes in abstract and landscape paintings and works on paper by compelling contemporary artists. Join us in celebrating the opening reception for Arabesque, an exhibition of new paintings by New York artist Tamar Zinn: Friday, October 10, 6-8pm. Interested in this event? Please call (212) 366.5368 for more information and sign up here receive notification about future events. 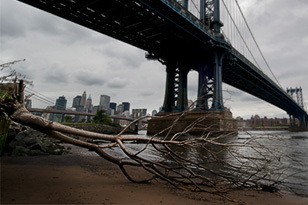 To view Tamar's work and our entire art collection, visit www.markelfinearts.com. "I'm sure that my political obituary will always have something about the Keating Five in it. I don't see how that could be avoided."